When charging or equalizing a battery, it is imperative that gases like hydrogen and oxygen are not permitted to collect inside an enclosed area around the battery. This can become a dangerous safety hazard because these gases can cause an explosion if left unchecked. The LSL Products Battery Compartment Vent Fan takes away that danger by releasing the gases outside. This way harmful fumes do not build up inside your battery compartment. 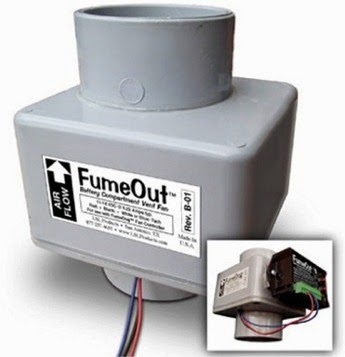 The LSL Products Battery Compartment Vent Fan consists of the exhaust fan and fan controller. When the controller senses the battery bank voltage is high enough to start producing gases, the fan comes on by itself. It shuts off on its own when the voltage goes back down to a safer level, saving power. There are preset levels to control when the fan comes on or goes off, or settings can be programmed for a more customized process. It features a failure alarm in the event that the fan has a malfunction and is unable to run, while the design allows it to be fitted into smaller areas. Between charges, the fan comes on for 5 minutes every 24 hours to clear out any gases that may have collected, adding further to the safety factor. This vent fan is compatible with batteries that take almost any kind of charge, including solar, generator or AC mains. It can be used with all the typical battery voltages, such as 12, 24 or 48V. Made in the USA, the LSL Products Battery Compartment Vent Fan also comes with a 1 year warranty.